After coming off of a tough loss to the Minnesota Vikings, the Los Angeles Rams rebounded at home with a dominating performance against the hottest team in football, the New Orleans Saints, winning 26-20. The game was not at close as the final score indicates, nor are the stats. Take away Saints RB Alvin Kamara’s 74-yard run for a TD and the final drive in garbage time, and the Rams would’ve won 26-6 by holding Sean Payton’s explosive offense behind QB Drew Brees to a mere 197 yards of total offense. The Rams came away with a solid win against a quality team, unlike last week. In this game all phases of the Rams team, offense, defense and special teams, absent occasional inexplicable lapses, played well. Going down the stretch with just five games left, the Rams are poised to make their improbable run to the playoffs. 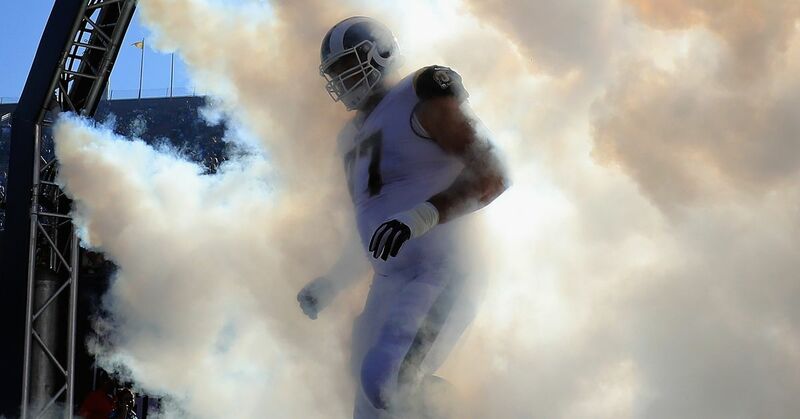 By winning this past weekend, the Rams proved they could bounce back from a bad game. Credit for the Rams’ resurgence as a contender goes to Head Coach Sean McVay and his entire staff who kept the team focused after the beatdown from the Vikings a week ago. As good as this victory feels now, there were still some glaring mistakes that have plagued the Rams throughout the season that have to be corrected sooner rather then later. With only five games left, the Rams don’t have a lot of time to fix these things. If the Rams want to be a participant in Super Bowl LI rather then among the other 30 teams watching at home, these things need to be corrected. The Rams were on the verge of breaking the game wide open in the first quarter after opening up an early 10-0 lead. After the touchback, the Saints were on their own 25-yard line to start another series. All the defense had to do was get a stop to get the ball back on offense. Having scored on their first two drives of the game, the Saints would have been forced to alter their entire game plan if the Rams scored again. Instead on 2nd and 9 from the Saints’ own 26-yard line, Kamara broke to the right and gashed the Rams’ run defense for 74-yard touchdown run. This has not been the first time the Rams’ defense has allowed a RB like Kamara to change the momentum of the game when the Rams were on the verge of crushing their opponent. It happened with Jaguars RB Leonard Fournette. Once into the 2nd level, a missed tackle later and Kamara was deep in the Rams’ secondary down the sidelines virtually untouched, leaping into the end zone for the score. I’m not one of those observers who give credit to the opposing team for a job well done when a run play like that is executed. That’s just bad defense. I’d rather get burned on a well-executed pass play. It can’t be Defensive Coordinator Wade Phillips dialing up the wrong defense since no one schemes to allow a running back to waltz into the end zone. Something is not right and most likely it has to be in the middle with LBs Alec Ogeltree and Mark Barron sliding too far the wrong way. They can’t get caught overpursuing where they think the ball is going. It puts them out of position to make the play when it goes the other way. Slide, but don’t slide that much away from the middle. In addition, the safeties and corners, upon spotting the play develop, must at the very least make a play to slow down the running back rather then engaging in a vain arm tackling attempt to bring the runner down. By actually engaging the running back, it will slow him down as help is always on the way. It may go for big gain, but at least it won’t go for a touchdown. Some will argue that this is being picky. I’m not one of those people. This must be priority one for a Rams defense if the team is going to make any kind of run in the next five games or the playoffs for that matter. In tight games, as most playoff games are, one score can make the difference. Worse is the fact that the Rams have been prone to giving up these types of momentum-changing runs, which will kill them in the playoffs, if they get there–it’s horrible defense and inexplicable. In the Saints’ game, another problem the Rams had was dropping sure interceptions. Corners and safeties are wide receivers without hands; nonetheless, a lineman can catch a ball thrown right to him. There were at least three or four instances where the football thrown by Brees looked intended moreso for a defender then a Saints target, but Rams CBs Trumaine Johnson and Kayvon Webster dropped the rock. Make the plays that you need to make that’s what you’re paid to do. The Rams have the uniqueness of having one of the best, if not the best, special teams units in the league. When PR Pharoh Cooper puts your offense at or over the 50-yard line, the Rams offense must take advantage of the opportunity of getting at least one first down and just enough yards for a PK Greg Zuerlein field goal–even better if they can score a touchdown. With 12:34 in the 3rd quarter and the Rams leading 20-10, Cooper got the Rams to their own 49-yard line. All the offense needed to do was go 15-yards and the ball would be in field goal range for Mr. Automatic. Watching the game from the confines of the Coliseum, Rams fans thought for sure this would be the moment that offense was going to put up six, or at worst three more points. Anything at that point would’ve really would’ve put the Saints behind the ball. They went three and out. Worse, they lost eight yards on a pass to WR Tavon Austin due to Tavon being Tavon Austin. On third down, the Rams threw in the towel and ran the ball with RB Todd Gurley for a minimal gain and in came the punt team. Rather then coming away with the minimum FG, the Rams did nothing which kept the Saints in the game. This was a clear blown chance. The Rams must take advantage of their special teams doing their job by putting their offense in the position to score points by doing just that moving forward. One could also complain about the red zone offense not coming away with touchdowns, bnut this was a problem for New Orleans as well. That’s a push since both teams have good defenses. The Rams’ special teams played terrific. Cooper, Zuerlein and P Johnny Hekker played up to expectations. Yet, there are some things that can make the special teams even better—staying away for the inevitable block in the back penalty. This penalty is so often thrown on punt returns, fans expect it. The rule of thumb is this—if you can read the name of your opponent, don’t put your hands on him. Running beside him even a shoulder push will be called a block in the back depending on the referee’s angle of vision. Stay with him and screen oneself between him and where he’s going to—the ball. Once the player tries to go through you, at that point you can block him. There’s nothing illegal about a shoulder shove, just remember depending on the angle of the referee its more then likely interpreted as a shove in the back when the defender flops onto the ground. The reason this is pet peeve of mine is that the Rams’ special teams are really good. I don’t like to see great runbacks giving the offense good field position ruined by a silly block in the back which could been avoided, especially if the block is away from the play. One can easily blame the ref, but that will get you nowhere. You’re wasting your breath. Finally, don’t block a gunner when he’s out of bounds. If you find yourself in the midst of a bunch of players, you’re out of bounds so stay away from the temptation to block in that area. This was a quality win for the Rams and a very impressive one at that. Rams fans have to like what they saw Sunday. Nobody’s perfect, but we’ll get there.